On Wednesday night, our good friends the Castor family came over for a night of family fun and a little BBQ action. We started by playing some bags games, but the kids were a little too competitive for the adults so we decided to shut that down and take it inside. After dinner, we introduced them to the Vive and watched them as they battled our virtual enemies. They were naturals and were able to take out a lot of bad guys for us. It was nice spending the evening with the Castor family! 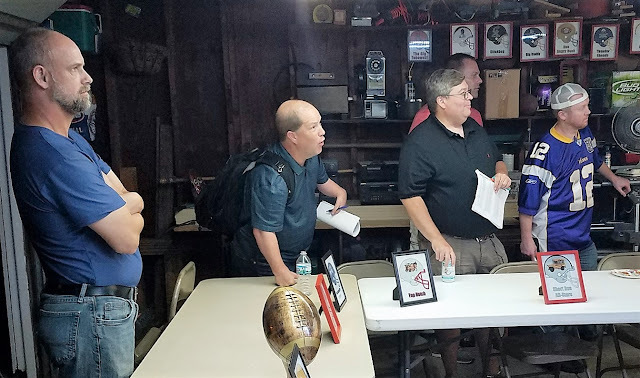 On Friday night, I drove to Cottage Grove to connect with several of my old friends from Nor-Tech. 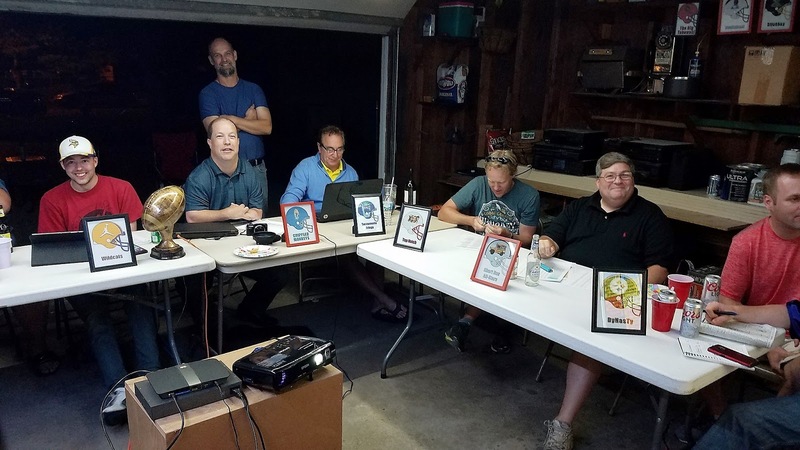 It was time for our annual Fantasy Football draft and I was quite excited to be there. Are you ready for some football? 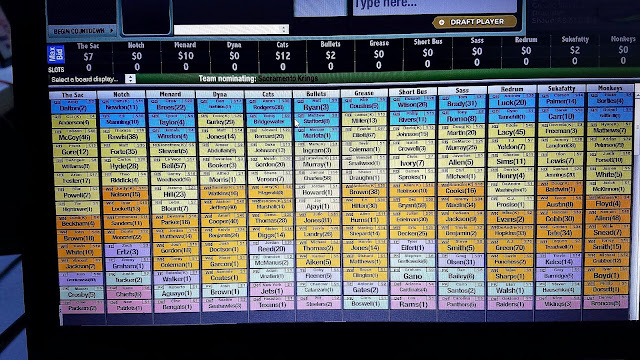 Steve "Cuds" Cuddihy has been our commissioner for about 10 years and really pulls out the stops with our annual draft. We have an auctioneer running the draft and all sorts of electronics set-up to give us a high tech display to keep us all updated on where we stand. I'm pretty sure I'm gonna win this year. As you can see, I was pretty fascinated with my roster at the end of the evening. My team is the Crippled Monkeys. I was happy to get my favorite player Adrian Peterson along with a bunch of other super stars. It's definitely looking like things are leaning pretty heavily in my favor. On Saturday night, Miss Sheri and I headed to Mystic Lake Casino to watch Jay Leno perform comedy. Jay was looking like he'd aged a bit and told quite a few jokes that were obviously written more than a decade ago, but all in all he was great. You could tell he was a master of his craft. He pulled out story after story for more than an hour and never missed a beat. He was actually better than I was expecting which made for a pretty fun night of comedy. On Tuesday night, we went to the Mall of America to meet our friends, Ron & Kristie Myers, along with their kids. They have such a beautiful family. We went to Benihana together because we hadn't gorged ourselves for awhile. Mission accomplished. I don't think they'd been to this restaurant before, but they seemed to enjoy it. On Wednesday night, we went to Outback to hook up with Miss Sheri's Aunt Mary and cousin Mary along with her husband Michael. They were in town from California so we decided to enjoy a little down under no rules cuisine. It felt just right. It has been two years since we had to go through the evaluation for Luke's heart and liver transplant. We decided to switch his care to the Mayo Clinic in Rochester because it's much closer to home from where we'd been going the past couple of years which was Lurie's Children's Hospital in Chicago. Things are looking really good for Luke currently. He received a pacemaker a year and a half ago and went on growth hormones. He has grown more than 4 inches in the past year. We're very glad we made the switch. We'd always considered going to Mayo Clinic since it's only an hour and a half drive for us, but we hadn't done it until now. Seeing that they were recently named the #1 hospital in the nation by U.S.News helped reinforce our decision. Miss Sheri has always been Luke's greatest advocate and carries his medical records with her to all of his appointments. Believe it or not, this is the very condensed version. Luke and Sheri came down on Thursday to go through a day of tests. I came down with them on Friday to meet with the liver transplant specialist and the heart transplant specialist. We were so impressed with the doctors. This is Dr. Driscoll and he is the cardiologist. He explained to us that they recently published a paper where they studied 1052 patients who they had performed the exact same Fontan heart procedure that Luke had when he was little and the associated effects that procedure has had on those patients' livers. It was so awesome to hear that they had so much experience with the exact situation as Luke. Dr. Driscoll told us he thought Luke's heart was still performing very well and we don't need to see him for another year. That's like music to our ears! We were hoping to get as good of news from the liver doctor, Dr. El-Youssef, and we were not disappointed. He was so smart and did such an excellent job of explaining what they know about cases like Luke and how there's still a lot that we don't know about Luke's particular situation. He did tell us that the liver is an amazing organ though and has the ability to re-generate itself which it appears may be happening with Luke. He said he couldn't even see the liver damage that the doctors saw in Luke two years ago and downgraded his diagnosis of cirrhosis of the liver down to liver fibrosis. We didn't even know this was possible. We were only hoping Luke's liver wouldn't get worse, but we didn't realize it could actually get better. We feel so incredibly blessed!! We credit his success to great doctors, a new medicine routine, positive living, and a whole bunch of prayers. We will never take his status for granted and recognize that we need to be grateful for every single day that he is healthy, but this is just such great news and we are so happy to be where we are at today. Miss Sheri also happened to have her birthday on Friday. This is the third year in a row that she has had to spend her birthday in hospitals and we are very hopeful that we can schedule next year's check-up on a different weekend. Our friends, The Brown Family, came over to help us celebrate Sheri's birthday. They're such nice people. We had a Vive party and gave Rhonda her first taste of Virtual Reality. I think she enjoyed it. On Saturday, we spent a couple of hours helping with another Eagle project. Braeden Malotky is in the same grade and same troop as Luke and Avery and it is his project. He and his dad, John, were very helpful with the boys projects so we were glad to have the opportunity to repay the favor. His project is a pretty big one that should be enjoyed by many people in the years to come. There's a Frisbee golf course at the high school that was built and never utilized so it was pretty inaccessible. Braeden is cleaning up all the holes to give players access and building cement tee boxes for every hole. It's going to be really cool to see it when it's all done. We had fun helping them move sticks and spreading mulch. I gotta get me one of these Kubotas! Of course, Miss Sheri crushed me in the productivity department as usual. She can just shovel way better than I can. It's tough being married to a Farm Girl. Saturday brought us Prior Lake's annual Lakefront Days parade and we were there to support the Prior Lake Robotic's team float. Before the parade began we saw a lot of old friends like Wayne who used to be the boys Tball coach about 100 years ago. I saw my personal work hero, Orlando Mazzolini, and his lovely daughter Sofia. They were here to support a friend who is running for city council. Ronald McDonald and I go way back. I used to go to his house and eat a lot when I was a kid. I met Tony Albright who is a member of the Minnesota house of representatives and a great guy. He has been a good friend to Prior Lake Robotics and is going to help us work on some projects this year. Some of the team captains had a chance to talk to Tony. They discussed ways to spread the word about all the good things that First Robotics is doing for kids to help them build their STEM skills as well as so many other great leadership qualities. We chatted with Melissa and Todd from the Prior Lake school board. We had a great conversation and talked about ways to continue to grow the robotics program going forward. Soon enough the parade started and we had to run to the front of the pack to see Avery. He normally works on Saturday mornings so he walked along with his co-workers at Versatile Vehicles. We saw Tony Albright again spreading good will to the community while spreading candy to the kids. We have been fans of Jason Lewis for years as he used to have a talk radio show in the Twin Cities before deciding to run for the US House of Representatives. Miss Sheri was standing on the side of the road taking his picture when he noticed her. He said a picture of him by himself was no fun so insisted she joined him for another shot. What a good guy! Most of the time, though, we hung out with the KING TeC kids. They looked so fashionable that it just felt good to be around them. Luke worked hard as he walked the parade route handing out program flyers to people in the community. Liz and I also walked much of the way trying to figure out ways to make ourselves useful. That comes real hard for me. Jackson and crew were rocking out as they made their way down Main Street. I don't know if Jen and Dan had the toughest job or the easiest job as they drove the float through town. After the parade, all the kids went to a party so we grabbed a few of the other parents and decided to have a party of our own on the boat. We even picked up a hitchhiker as we passed by Pat Hines on her dock. She joined us while we hung out on Candy Cove. All in all, it was a pretty darned good day!